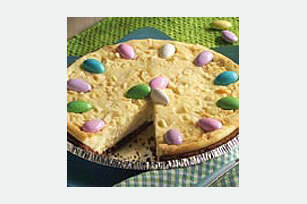 Candy-coated almonds give this easy-to-make white chocolate-cheesecake a distinctly festive appeal. Preheat oven to 350°F. Beat cream cheese, sugar and vanilla in large bowl with electric mixer on medium speed until well blended. Add eggs; mix just until blended. Stir in half of the white chocolate. Pour into crust. Sprinkle with remaining white chocolate. Bake 35 minutes or until center is almost set. Cool. Refrigerate 3 hours or overnight. Top with almonds just before serving. Store leftover cheesecake in refrigerator. Enjoy a serving of this rich and indulgent cheesecake on a special occasion. Prepare as directed, omitting white baking chocolate and substituting ready-to-use graham cracker crumb crust for the OREO Pie Crust. Prepare as directed, substituting 1 pkg (4 oz.) BAKER'S Semi-Sweet Baking Chocolate, melted, for the white chocolate. Stir melted chocolate into batter after mixing in eggs.